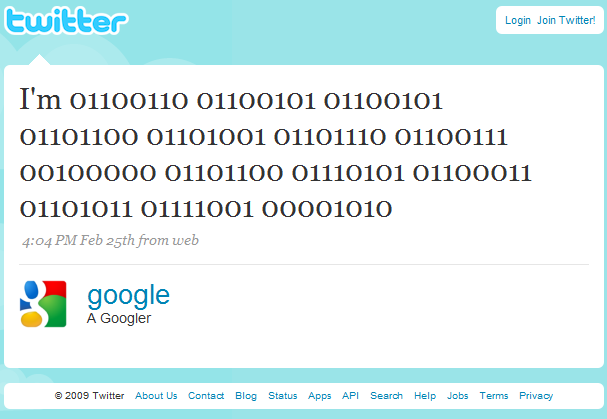 Google has recently launched a Twitter account to share byte-sized news and updates. Twitter, a startup founded by two former Googlers, started to become very popular and it's regarded as the next evolution of blogging. * App Engine - a not-so-frequently updated list of Google App Engine news. In other news, you can follow the latest headlines from this blog at twitter.com/googleos, where I'll also post news and tips not included in the blog. Send your tips, questions and suggestions to @googleos. Come on, guys, please don't start splitting up your tips between different sources! your blog is my most exciting feed in google reader when it has updates, and i don't wanna have to grab the twitter RSS just to get mostly duplications and the occasional non-duplicate tip! "... it's regarded as the next evolution of blogging." Please, please don't let it be so. I appreciate the benefits of blogging via cellphone/text message (particularly with liveblogging of real world events). But the Twitter approach practically encourages the kind of self-absorbed, utterly banal writing that I disdain in places like myspace. In particular, the 140-character limit works to inhibit thoughtful writing; you can't fit much more than a single isolated thought into that space. The only subject line offered by Twitter is "What are you doing now? ", encouraging participants to write about the most trivial, momentary and meaningless details of their lives. And the LIFO ordering of Twitter logs makes them bloody annoying to read through later. The content and prevalence of the "tweets" made by many congresspeople during Obama's recent congressional address highlights these issues quite well. At least with sites like myspace there is a marginally better chance that writers will take the time to write something that requires some degree of thoughtfulness. I like Tumblr's approach, which while similar to Twitter in some respects, doesn't encourage vapid writing to such a degree. I'll see what I can do about this, but more than 800 people subscribed to the Twitter account, even if it only included the headlines from this blog. I'm not very familiar with Twitter, so your suggestions are welcome. The good thing is that we can easily spot when you post headlines from your blog on Twitter, because they begins with the title of the post followed by the beginning of the post, so we know that this is meant to be continued, and we can skip them in our feed reader, and wait to get the entire post while reading your blog feed. Long ago I asked U if U are on twitter; But atleast now, you are! Good Move! But I think more than just posting tips, U should engage on twitter in realtime conversations; thats what twitter is about. this binary conde means "i'm feeling lucky"